Located in the South-eastern France, on the Isère River, 20 kilometres North-east of Valence, this city owes its renown to its architectural buildings. It is part of the Drôme department. Its business is mostly focused on some activities: traditional industries, shoe-making, tanning and new factories such as metalworking, nuclear fuel and precision engineering. With its blend of the Romanesque and the Gothic, the Collegiate Church of Saint-Barnard is one of the most important building of this city. Above the Jacquemart side flanked by 13 and 14C houses stands its Belfry. It is a remnant of a tower from the surrounding Roman wall and is decorated with a clock bearing a jack of the clock which has been striking the hours since 1830 in the uniform of the 1792 volunteers. In order to celebrate its tradition, the International Shoe Museum shows the way people have dressed throughout history and in several parts of the world. Romans-sur-Isère is full of cosy bars and pubs where you will have the chance to enjoy traditional French food. You can also enjoy listening to different kind of music in the several pubs that this city offer. To have a full shopping experience, the Marques Avenue Romans outlet is the right place to go. Not only can you go shopping but also you can find traditional clothes in many of the factory shops specialised in shoes and leather. In general, this city can offer you a wide range of shops, for every age and gender. This city is characterised by a mild, warm and temperate climate. Romans-sur-Isère has a remarkable amount of rainfall during the year. Precipitation is the lowest in July, whereas the most precipitation fall is concentrated in October. 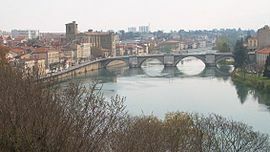 This city is connected to other cities by train and there are also different buses lines moving around Romans-sur-Isère and connecting it to another city, Bourg-de-péage.